My German Shepherd is 2 1/2 yrs old. Her name is Greta. One night my husband and I went out, and as usual we left the house in the care of Greta and told her to be a "good girl." When we got back I noticed that a 12 pack of toilet paper rolls was opened and many were missing, all I could think is OH NO she shredded them. I made my way up the stairs to my bedroom to investigate. Our bedroom has a master bath connected to it, but I had the bedroom door shut. In front of the door there were the toilet paper rolls, stacked neatly into a pyramid shape four on the bottom, then three, two, one. I knew that it had been my little mischevious Greta because there were teeth marks in the rolls! If anyone has had a similar situation of their German Shepherd organizing or stacking anything, email me at MDuespohl@yahoo.com. She probably thought, what a lazy mom, can't even put the toilet paper away! 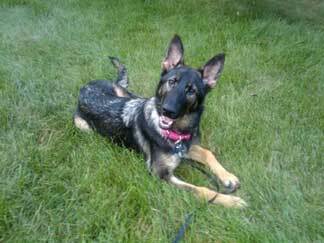 My GSD Hollee also took a pack of 12 rolls one day when I left the house to go to work. When I came home I found all of the rolls stuffed in the toilet. it took me all day to unplug the toilet but I laughed the entire time. How did she know that's where it goes??? I too had a similar experience with my dog. just wanted to say that the pic above my story isn't my pretty girl. I will be working on gathering pics for the site in the near future.